“I’m disappointed that the Council didn’t consider the safety issues of 2,000 vehicle movements a day and an annual maintenance bill of $30,000 a year as good enough reasons to finally seal the road. “40 years ago, I was a police patrol Sergeant at Bellerive, ” Clarence Councillor Tony Mulder said, “and the same safety problems existed then – and still we have done nothing”. Councillor Mulder surveyed Begonia Street residents and found that most were ambivalent, but more favoured sealing than wanted to leave it as a gravel surface. Those opposed were concerned it would increase traffic through this dangerous ‘rat-run’ but at 2,000 car movements a day, it is hard to see how it could be more congested. Furthermore the vehicle count has not changed despite a general increase in traffic through the greater Hobart area or the changes at the eastern end of the Tasman Bridge. 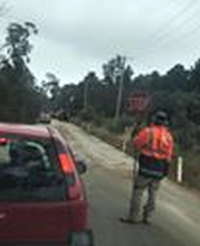 “I have little doubt that the wider community are as much in favour of sealing this road as they are in extending the Flagstaff Gully Link road to Geilston Bay”, Councillor Mulder said. The long term solution to Begonia Street traffic and Tasman Bridge morning congestion is an Eastern Ring Road linking Lauderdale to the Bowen Bridge. Such a road is a state responsibility and would be easily achieved by extending the Flagstaff Link Road to the East Derwent Highway at Geilston Bay. “And again”, says frustrated Lindisfarne resident Natasha Louise as more of the $30,000 pa is spent on an inadequate substandard gravel surface. Facebook post used with permission.